Milan is the center of high fashion and style but it’s also historic and atmospheric, with many beautiful buildings. There are many museums to visit in Milan, including the Pinacoteca di Brera art gallery, which houses works by artists such as Raphael, Caravaggio, Tintoretto and Rembrandt, and the Museo Nazionale della Scienza e della Tecnica Leonardo da Vinci, where you can see working replicas of some of da Vinci’s inventions together with his original sketches for them. Fans of da Vinci’s work can also see “The Last Supper”, which he painted between 1495 and 1497, in Santa Maria delle Grazie Church and Convent – although you’ll need to book in advance for this. 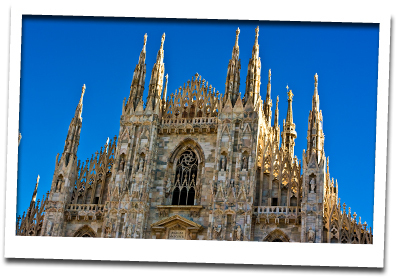 the Duomo – the cathedral is one of Milan’s best-known landmarks and has 135 spires. Climb to up to the roof for stunning views of the city. the Teatro Alla Scala Opera House – this world-famous opera house, often simply referred to as La Scala, was built during the 18th century, and you can see a ballet, opera or orchestral performance here. You can also visit the theatre’s museum, which includes a piano that once belonged to Verdi amongst its many exhibits. the Castello Sforcezco – the 15th century court of the Sforza family now houses a Museum of Ancient Art (which features Michelangelo’s Rondanini Pieta), a Furniture Museum, an Egyptian collection and several other collections of artefacts. the Quadrilatero d’Oro area and the Galleria Vittorio Emanuele II shopping center are two of the most popular destinations for shopoholics. Dining in Milan is a delight with many excellent restaurants for you to choose from, and there are many bars, clubs and live music venues, where you can drink and dance the night away. Although there’s plenty to do in Milan, if you hire a car you can explore other Italian towns and cities, such as Turin or Pisa, or visit the Italian Lakes, which include the beautiful Lake Como. You can also break up your holiday by using your Milan hire car to drive to another destination, such as Florence or Siena, for a few days. You can use Milan as a base from which to explore the vineyards of Tuscany or see some of Italy’s most famous works of art, and hiring a car allows you to see things at your own pace. The largest Milan airport is Malpensa International Airport (MXP). Malpensa International Airport lies about 45km north west of the city, and you can hire a car here.